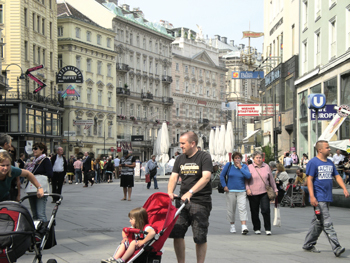 Vienna is an ideal city to be emulated for multimodal transport, says Bina C Balakrishnan. Here, she writes an experiential piece on how, despite being new to the city, she could comfortably travel using public transport ? without any fear of a motorist hitting her on the street, and could get information on the modes of transport easily. No wonder tourists throng to Vienna, bringing its government substantial revenue. Sustainability is a buzz word these days – especially in the context of urban transportation systems. But what exactly does ?sustainability? in the transport sector mean? Many things, but in a nutshell ? it implies meeting the requirements of mobility of the current generation with minimal impact on the environment and climate change, and without detracting from the ability of future generations to meet their mobility requirements. Though multi modal mass transportation systems are seen as the solution to high levels of congestion in urban areas, planners in India need to realise that the mere presence of a mass transportation system in the urban scenario will not do away with congestion. The system has to be attractive in terms of speed, comfort, convenience, safety, accessibility, availability as well as in the most important aspect – dispersal facilities at the end of the trips. The system should be so attractive that people find it more convenient to travel by these modes than in their own cars. While attending a conference on information integration in transportation systems at St. P?lten, Austria last September, I decided to club it with a trip to Vienna. St. P?lten is about a half hour?s train ride outside Vienna. And when there, I realised why Vienna has been rated as the World?s Most Liveable City as per the 2012 Mercer Quality of Living rankings. While this ranking includes all infrastructure, services and factors such as internal stability, quality and cost of living, transportation and levels of congestion (these are included too) are what I decided to explore. So, along with a friend, I drew up an itinerary covering Vienna, St. P?lten, Salzburg & Innsbruck. I made all our bookings through the internet ? 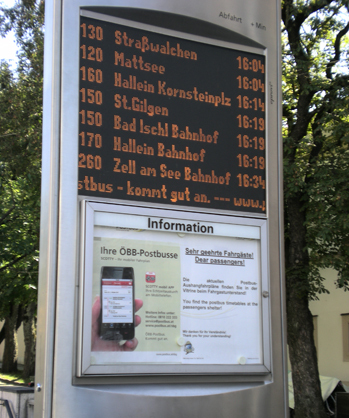 air tickets, hotel bookings, Mozart concerts and train tickets between the cities. Since I was arriving at Vienna late at night, and I am never one to tempt the unpleasant in a new city, I booked a taxi through the internet to take us from the airport to the hotel. Beyond that, the two of us ended up walking through the cities of Vienna, St. P?lten, Salzburg and Innsbruck, only using trains to travel between the various cities. We would leave our hotel rooms very early every morning, walk to one of the farther tourist spots, after which we would stop for breakfast at one of the beautiful street side cafes. A little rest, and we would be up on our feet, walking again until lunch time, taking in everything there was to see. We stayed outdoors from early morning to late evening, returning to our rooms pleasantly tired only after dinner. The weather was beautiful, but apart from that, it was the near perfect design of the roads and the thoughtful provision of conveniences for people within the city that enticed us to walk ? and we enjoyed every minute of it. I know for a fact that people half our age would have found it difficult to do the kind of walking we did in any one of our (Indian) metropolitan cities ? let alone four of them. We were travelling with suitcases, and pulling them along to the train stations or to the hotels. And neither of us felt the strain of either dragging the cases over a kilometre or of walking the distance. The transportation infrastructure of the entire country has been retrofitted with pedestrians as the focus. In Vienna, the city centre ? Stephensplatz ? is an enormous pedestrian precinct around St. Stephen?s Cathedral which is serviced by buses, underground metro and horse drawn buggies. The area has been re-designed for pedestrians and cyclists. In this mature urban area, road space has been reallocated, with the greater width given to footpaths and cyclists. Cyclists have separate tracks on several roads, but in the precincts they share the space with pedestrians. Several lanes are completely closed to vehicular traffic, and these road spaces are interestingly used for other purposes. All streets are active streets, in that there is human presence and activity, which lends majorly to street safety through the ?eyes on the street? concept. Many streets leading to this precinct are mixed use streets and do allow vehicles, but the lane widths and speeds are strictly controlled, and honking is banned. 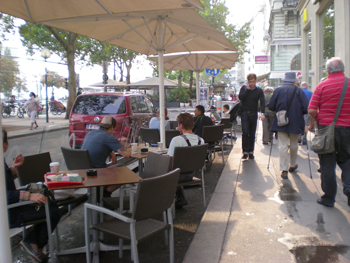 These streets have traffic calming measures in place, and street cafes are to be found on almost every street. Surprisingly ? or maybe not surprisingly – every caf? seemed to be crowded with customers. There is a fulsome sense of enjoyment while walking ? the cityscapes with their baroque architecture, the incredibly beautiful baroque sculptures and fountains, vistas opening up unexpectedly, drawing you to explore new streets, the pedestrian facilities perfected down to the last ?t?- footpaths even and well lighted, and benches and drinking water fountains seem to be just where you look for them. And for walkers like us — well maintained public conveniences were always available for nominal 50 Euro cents. But most importantly – all around you is the absence of fear from the motor vehicle. The sense of safety and well-being is incredible, and this held true in all the other cities as well. The city has been fully designed to be served by an integrated network of mass transportation systems ? underground metro, buses and trams. And dispersal or feeder modes are trams, bicycles or walk.